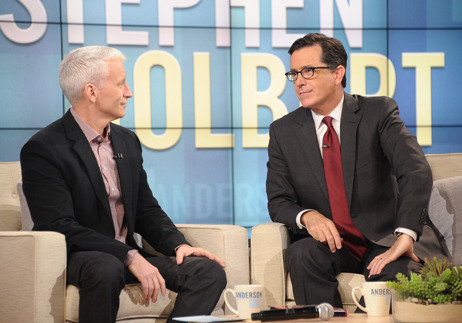 Anderson and Stephen from December 6, 2005 - Stephen is getting tired of all the comparisons between himself and Anderson Cooper. In a little lighting experiment, Stephen turned Anderson green! Anderson and Stephen from October 18, 2007 - when Stephen asks Anderson Cooper (AKA "The Silver Surfer of News") how people can help the environment without any inconvenience. Anderson was promoting CNN's Planet In Peril. Did you catch Anderson little guest appearance on the Colbert Report last year when he offered to be his new best friend? That was hilarious and adorable at the same time. And later I think Anderson also mentioned it on the Ridiculist when he put Stephen on for "stealing" the phallus story. The banter between them is just wonderful. Thanks for posting these videos. In Saturday's ATA post a few of us posters discussed Anderson giving more of his opinions. What a cowinkydink in the first video, Colbert asks Anderson if he is "one of those opinion guys" and Anderson replied no, he doesn't like 'wearing your opinon on your sleeve." I wish Colbert had paused long enough to let Anderson come up with an answer to "If you weren't doing this, what would you do?" Anderson might have come up with a terrific answer but Colbert quickly asked another question. Will Anderson be returning to 360 this week? Or does he have the week off except for New Year's Eve?